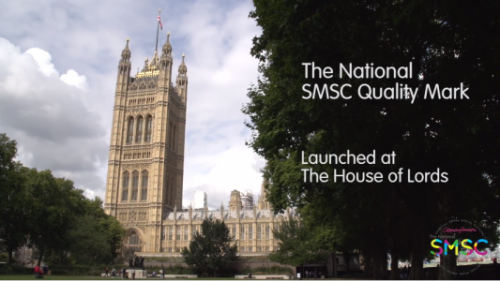 On 18th September, we celebrated the launch of The National SMSC Quality Mark in the House of Lords. The SMSC Quality Mark is the outcome of work undertaken between The Citizenship Foundation and experts in the field of education who have expressed the need for a SMSC self-review tool that will better equip schools to implement their vision for SMSC and to review provision for their pupils’ SMSC development. Lord Jim Knight, Chief Education Adviser at TES, hosted this event and discussed how the timing was right for the launch of the Quality Mark, as there is a particular need for Spiritual, Moral, Social and Cultural Education at this time. The keynote speaker, Steve Chalke MBE, founder of the Oasis Charitable Trust, only furthered this idea by sharing a pertinent personal story and spoke of how the SMSC Quality Mark is an important development. Other speakers at the launch event included Janet Palmer, HMI lead for SMSC, Justin Blake from Windlesham House School in Sussex, Sam Done, Principal of Hillcrest Academy in Leeds, and David Harris from Abbey Catholic Primary School in Birmingham. All of the speakers followed a similar framework and touched upon how the SMSC Quality Mark captures the essence of education and how we should be celebrating its place at the heart of learning and school development. Below is a video compilation of the launch event, highlighting some of the speeches that were made, as well as some of the audience members feelings towards the Quality Mark. If you are interested in learning more or applying for the SMSC Quality Mark, Click Here.